Multipure's Aquaversa Drinking Water System offers a powerful and convenient method to obtain cleaner, clearer, more healthful drinking water in your home or office. 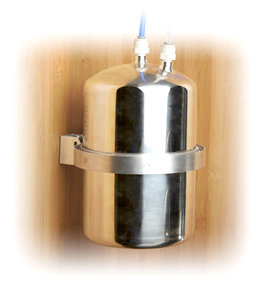 The Aquaversa features a stainless steel housing and is designed for installation versatility. Increases filter capacity to 120 gallons. NOTE: The Capacity Monitor Kit must be installed with a Below-Sink Kit (AQKITB). Both the monitor and light indicator are battery-powered (2 x AA batteries not included); batteries need to be changed each time the filter is changed. This solid carbon block filter is used with the Aquaversa filter unit.